When we travelled to the US in October, I had big plans to collect three specific caches to inch ever closer to completing the elusive Jasmer grid. My research revealed that we would be near three of the four remaining months I needed: January 2001, March 2001 and November 2000. That last one was particularly important, because it doesn’t exist in Europe. Let’s back up a minute: whenever I mention the Jasmer Challenge on social media, a few people always ask what it is. Here’s a quick explainer. The challenge cache dates back to 2008 when jasmerb placed the first version in Northern California. 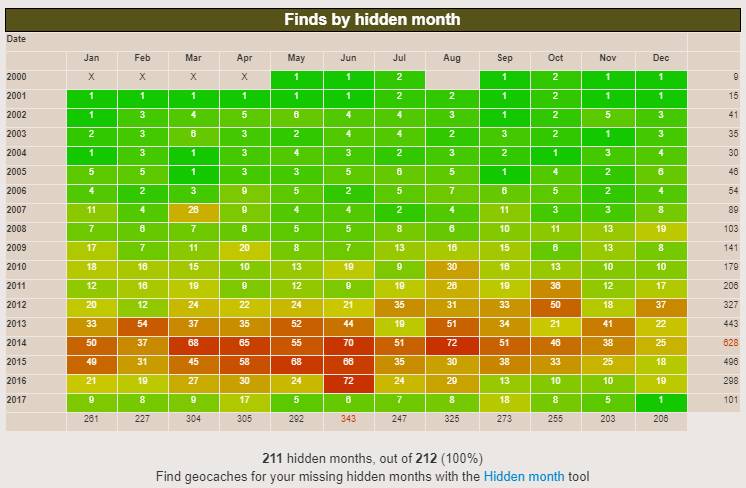 The idea is to find at least one cache placed in each month since geocaching began. It’s a difficult challenge as it will involve travel. If you live in Europe, it’s impossible to complete it on your own continent. I now only have one month left to fill – August 2000 – and there is a single cache from that month in Europe: Match Stash near Stockholm in Sweden. Thankfully, I found all three caches I had targeted. I had no intention of writing this blog post until I finished the Jasmer challenge, which I hope to do sometime during 2018 on an a trip to Sweden (which hasn’t even been booked yet!). However, that elusive November 2000 cache – the most important one as it can’t be found in Europe – ended up being one of the most memorable geocaching adventures I’ve ever had. So I figured it’s worth writing about. Monte Cristo looked the most enticing – a hike to an old mining town – but with a day of our Seattle itinerary already taken up with the A.P.E. cache, we couldn’t fit it in. Orange County Stash (V3.0) looked like a significant hike that we probably weren’t properly equipped to undertake. 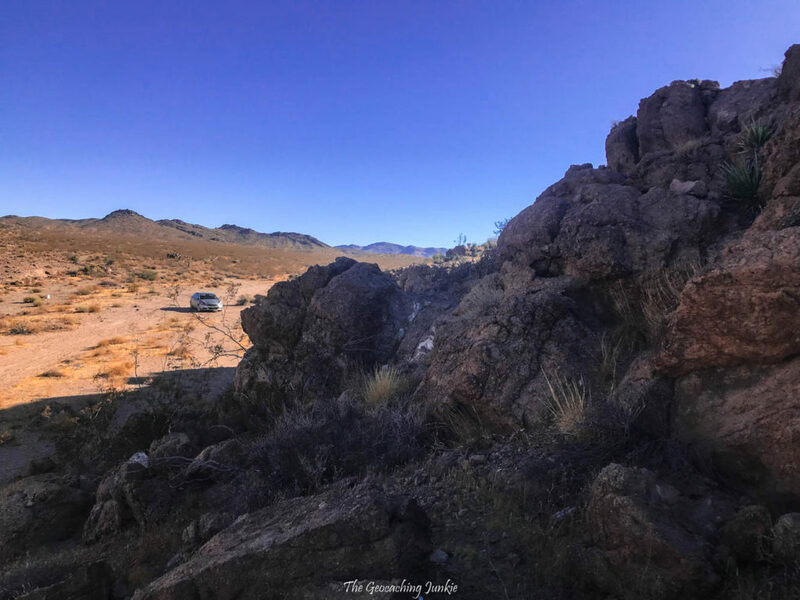 So that left Azucar Mine Offset, which unfortunately was a mystery cache that had me scratching my head. As luck would have it – somewhat amazingly – I had a scroll through previous finders and I knew two of them! I got invaluable help from IrishCubsFan and steben6, and the cache maintainers, NF5, confirmed I was on the right track (huge thanks to all these helpful cachers!). … it looked like almost all recent finders had driven to the coordinates. That seemed simple enough, no big deal. WARNING! DANGER! 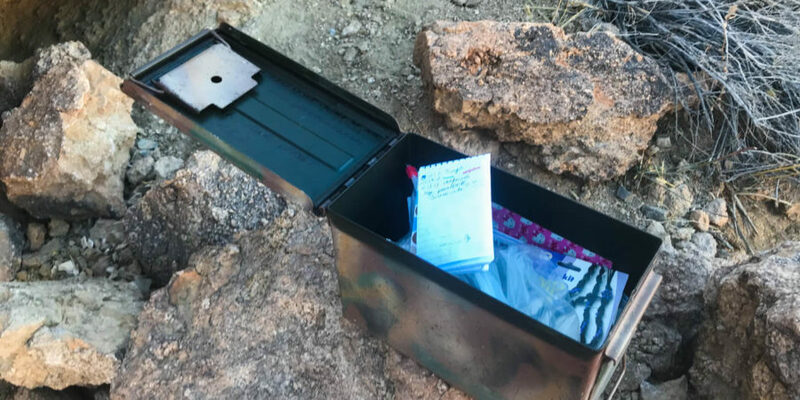 THERE ARE OPEN, UNMARKED MINE SHAFTS AND THE POSSIBILITY OF SNAKES AND OTHER DANGEROUS ANIMALS AND/OR INSECTS IN THE AREA … WHENEVER YOU GEOCACHE ENSURE THAT SOMEONE KNOWS YOUR ITINERARY AND WHO TO CALL SHOULD YOU NOT RETURN ON TIME. Moving on … it took over 2 hours to get from Long Beach to the highway exit closest to the cache. 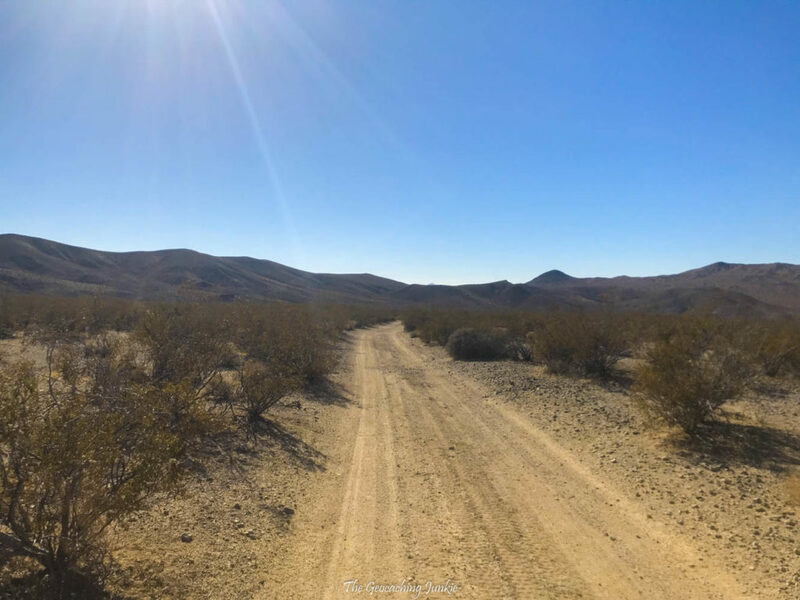 A few minutes later, we found ourselves driving along a dirt road. I was a bit apprehensive at this stage but the Dodge Dart we had rented was making light work of the journey. After another few minutes, we needed to turn off the unpaved road. It quickly became clear that the ‘dirt road’ we just left, was a main road compared to what we were now driving on. I guess that’s why the cache page says you should hike in from there. I suddenly developed a knot in my stomach. 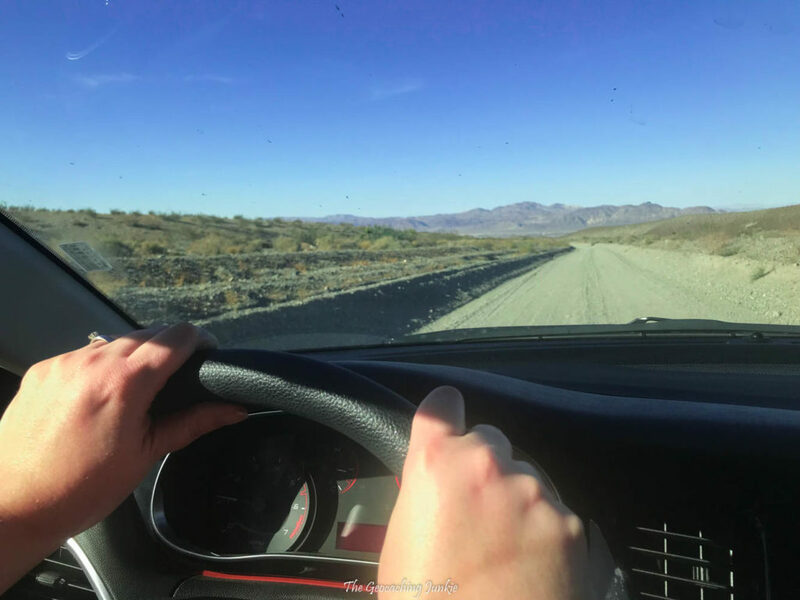 Our compact rental car getting stuck in the sand in the middle of nowhere – how would we explain that to the car rental company? For now, it was coping well so we drove very slowly onward, until we heard – and felt – an ear-splitting scrape. What was that?! My knee-jerk reaction was to swiftly reverse. Another gut-wrenching scrape. We both quickly exited the car and saw what had caused the screech: rocks in the middle of the makeshift track. The car seemed to still be working okay – obviously we couldn’t see the underside of it and it was almost certainly scratched, but it was still operating as it should, which was a relief. At this point, I expected the muggle to suggest turning around but he was keen to keep going since we’d come this far. I didn’t want to risk damaging the car (further), and since we were about 1.5 kilometres from the cache, I suggested walking. 1.5 km is not a big deal to walk in Ireland, but in the Southern Californian sun it was a different story. We got very hot, very quickly, but that was soon to be the least of our worries. We were about 500 metres in to our brisk walk when I saw something move and whipped my head to the right. Did you see that?! He hadn’t seen anything, but I definitely had. Something four-legged and furry walking quickly away from us. He suggested maybe it was a plant. I replied that I’d never seen a plant that looked quite so canine. He asked what I thought it might be. Only one word jumped in to my mind: Coyote. I can’t say for sure if it was. It could have been a large, oddly-coloured fox or someone’s escaped dog for all I know, but needless to say, after I uttered that word, there was no need for further discussion: we were hastily walking (but not running) back to the car. That is probably the fastest I’ve ever walked anywhere. Ever. Once we were safely ensconced in the car, we sat in silence for a few moments. I waited for the suggestion to turn around. It never came. Instead, the muggle suggested maybe if I position one of the wheels of the car directly over the rocks, I might make it without doing any more damage. I wasn’t convinced, but he seemed to be. The line between crazy geocacher and sensible muggle was becoming ever more blurred. Shaking, I went for it and after a few nerve-racking minutes, we had reached an open area and were as close to the cache as the car could get. A brief climb up to GZ ensued and while I searched in the wrong spot, the muggle found the cache. My hero. After I signed the log, I hastily took a few photos with my phone and returned the cache. I just wanted to get the heck out of there as soon as possible. My nerves didn’t really settle down until we were back on the paved road. When I look back on it now, I fully accept how ridiculous it was. I’m sure if we had a 4×4 vehicle, we would have just breezed on down that track without any issue. 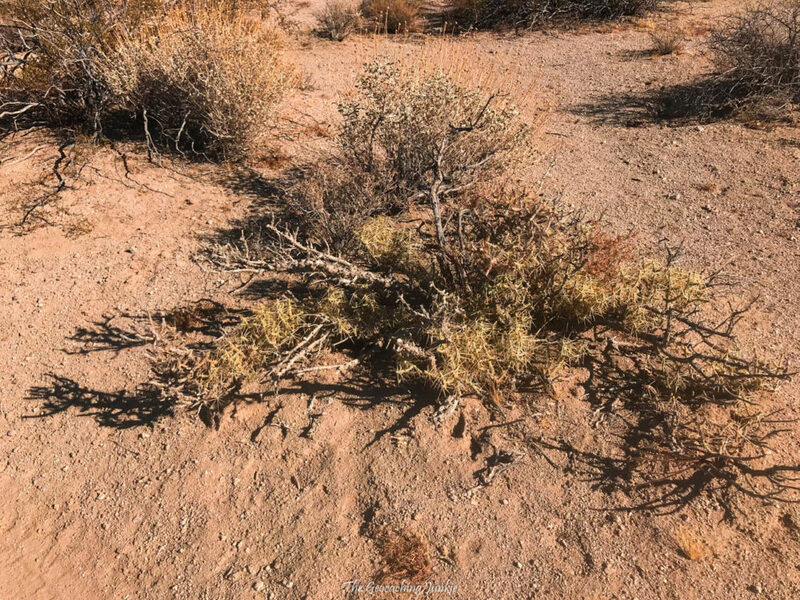 Despite our brush with the wildlife – whatever it may have been – I am very grateful that we didn’t see any snakes or spiders! Looking back, I have undoubtedly done some crazy – and arguably quite stupid – things in pursuit of a cache. But I guess those ridiculous things make the best stories! 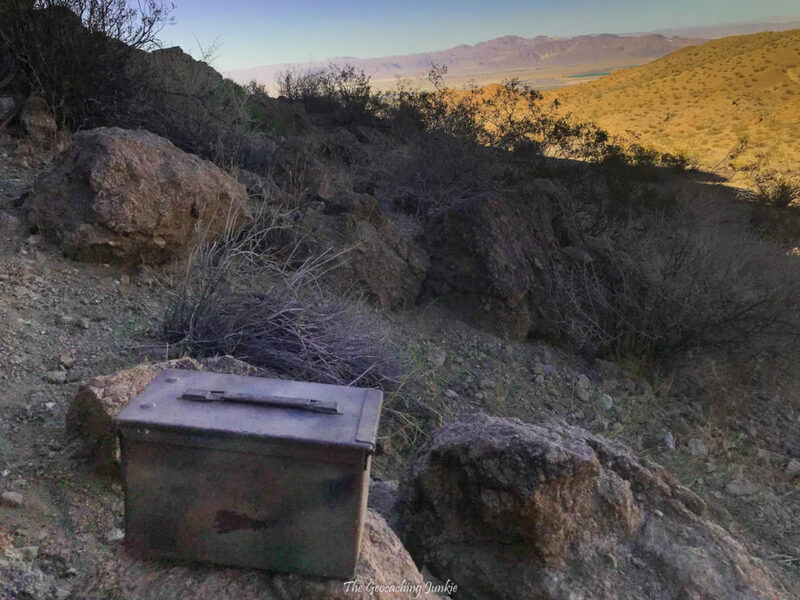 What’s the craziest geocaching adventure you’ve ever been on? Great Story. We just had a Nov 2000 cache archived and there was a pilgrimage by many to grab it before it was gone. I was told beforehand that there were only 13 around for that date combo. Anyway, in early November my son had a day off of school, and after going to a GIFF the night before, him and I drove to a hotel within an hour away so I we could grab it. That day we were able to fill in Nov 2000, Dec 2000. I have 12 dates left and all of them mapped out and most likely will finish next summer. My son thought I was crazy we were making this trip, but I told him someday he’ll thank me, when his jasmer is complete. Thanks for the fun story. You really captured the excitement I feel approaching a cache placed in 2000. 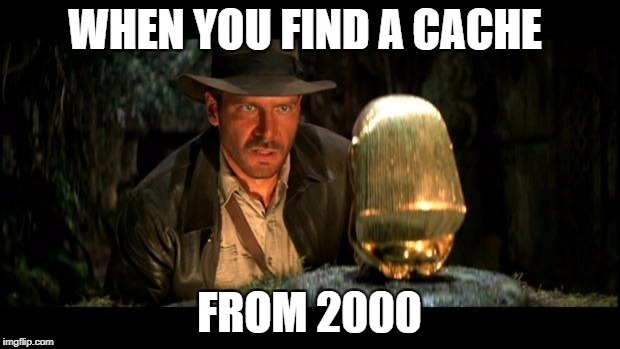 Seems like back then people made an adventure out of placing a cache. I love Jasmer! FYI for next time, a Coyote is no threat. I hear or see them near my home most every day. They are clever animals and great fun to watch. Take care. I got Hembre Ridge GCA5 for my November 2000 cache. It also was quite the adventure, though it was in the snow not the heat. It involved me getting my 4×4 truck stuck in the snow and wondering if I was going to have to walk out in the dark. I eventually got the truck unstuck, but it was dicey for a while there. And of course no one knew where I was and I was by myself. Quite crazy indeed. What we’ll do for a ammo box in the woods. Thanks for the great post. I have only June, July and August 2000 left to fill in my grid. A trip to northeast Georgia in the spring should yield all three spots! Thanks Michael, it’s great to get so close to finishing this awesome challenge, isn’t it? LOL @ the coyote scare, most of the time they run from people…if not, just pop off a shot and they’ll be gone quick…one of the first things I learned was to ‘kick it before you pick it up’, that rock or ammo can might have a scorpion or black widow on the bottomside of it, they can scurry around and sting or bite you before you know it…still, sounds like you had some exciting times out there!